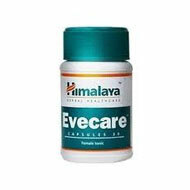 Evecare regulates the menstrual cycle by virtue of its uterine stimulant action. Evecare capsules are useful when the following symptoms are displayed: premenstrual syndrome; dysmenorrheal; menorrhagia, metrorrhagia, oligomenorrhea, dysfunctional uterine bleeding, assisted conception. 1 capsule twice daily for 3 months. In severe cases, 2 capsules twice daily. Evecare has a regularizing influence on the menstrual cycle by virtue of its uterine stimulant action. Evecare's stimulatory effect on the ovarian tissue helps regularizing endogenous hormonal secretion, enhances the repair of the endometrium and thus controls abnormal uterine bleeding. Evecare's anti-inflammatory action has a healing effect on the uterus and its antispasmodic action alleviates pain. The immunomodulatory and hematinic properties of Evecare are beneficial in anemia and the generalized weakness, associated with uterine disorders.